When Mum and Dad split up, Em feels as though her heart has been torn out. Trying to cheer up her sister and brother, she looks for comfort in stories of heroes and heroines. But can Em become the heroine of her own story, and find a fairytale ending powerful enough to bring Dad back? A heartbreaking and inspiring tale from the pen of a master storyteller. A wonderful book about a girl called Em. She helps make her younger siblings Vita and Maxie happy at the hardest of times. Great book. I would recommend. everyone should read this amazing,superb,fantastic,heartbreaking, imaginative, beautifull book!!!!!!!!!! loved it! Quite sad. It had an exciting ending and it left me wondering what was going to happen next! Jacqueline, great book! i love this book….it rocks i have read it like 7 times and i am reading again!!!!!! if you haven’t read it,you’re making a big mistake read it now!!!! very good book i read this twice! So sad yet brilliant book!! When Emily’s Mum and Dad split up it feels like the end of the world but she doesn’t have time to cry about it. she has to cheer up her little brother and sister, comfort her Mum and bare the spiteful attacks from her Granmother. Will Em’s Dad finally come back? An amazing read, very surprising and unputdownable. clean break is really sad when their dad leaves and it makes me glad my dad will never leave. when em goes to the book signing it makes me want to go to one for Jacquline Wilson even more. Quite sad…....... It was Christmas day and their dad left the day after and it was really sad. It was a little rude sometimes but I think you’ll like it. They saw him quite often but they didn’t see him daily. He took them after school without their mum knowing to a beach far away. They arrived home really late about 9:30 feeling tired. Their mother was furious and told him to get out of her life and said she never wanted to see his face ever again. She announced that they where having a clean break but as time went by she regretted it to her widths. She cried every night hugging his pillow. They had one son Maxie the youngest, the middle child Vita and the oldest Emily. Includes a grumpy grandma as well. This is another one of Jackie’s lovely books about family issues and problems. I’d recommend this for people from 10-16 years of age. loved it jacquline wilson youve made an exellent book again. This book is truly amazing and one of Jacqueline Wilson’s best books (in my opinion!). She really makes each character have their own personality which is really helpful when you are reading the book because you can imagine yourself being them. The book is about a girl called Em who’s parents split up, and as she is the oldest sibling it’s her job to pull her family together and make them happy again, as they once were. This is a good book by Jacky. I like how Em plays with the reindeer (I think that was what it was!) puppet. This book faces real life challanges and the book solves the problems like in real life except for the end when the dad comes back ad the mum takes him back I know I wouldn’t if he cheated on me . I relly like the kids and iwas happy when the grandmother begins to date the man from spain. This book was emotional but funny. this book is rally cool! at one point it is shocking but this book is recommended! 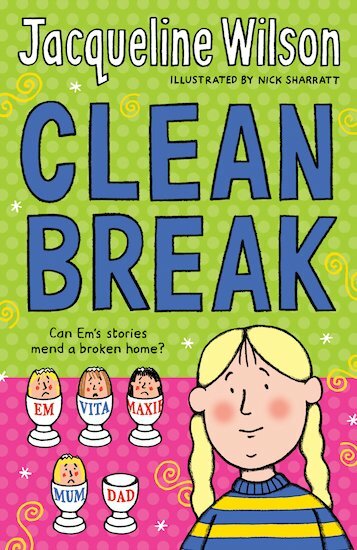 I loved Clean Break. Everything about it was so well written, and the storyline was so thoughtful and something that alot of kids could relate to. I loed the prancer puppet, I thought that part was really lovely! I loved this book eps when em’s stepdad told them stories about them having their own towers.I did not realy understand what happend at the end but i still love the book. A great read, sad at times though. I really hope her dad and her mum don’t get back together, because I liked her dad at the beginning, but then her left and I thought he wasn’t worth it. I was surprised when he left her! i loved it!! It was such a shame that ems dad left them for a different girl! I think Em’s dad is just silly for leaving his three kids like that! Em poor girl lost her Dad when she was young I feel so sorry for her, but of course this Jacqueline Wilson where talking about!! Of course she meets her Dad again and wants to see him everyday!! In the top 10 of my Jackie books!! I feel sorry for Em because she has to cheer her brothers and sisters up. 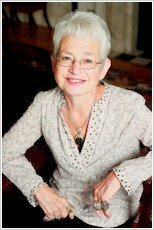 Jacqueline Wilson is my all time favourite author. I give this book 5 stars. THIS BOOK IS FANTASTIC I LOVE IT !!!!!!!!!!!!!!!!!!!!!! If you want to know about the book just ask me i know ALL about it and anyway i know this is nothing about the book but you DARE say John and Edward are bad. I love the way Em’s stepdad calls her Emerald!